Over the last dozen years, our nation’s educators have dramatically improved K-3 literacy skills. A return to phonics-based instruction, improved teacher-training, and increased funding (including lower primary class sizes) all share credit. Recent National Assessment of Educational (NAEP) fourth-grade reading scores attest to this improvement. Especially encouraging are the increases in reading performance by lower socio-economic students. Indeed, we have made solid progress in learning to read at these age levels. However, reading scores still level off in upper elementary and noticeably decline in middle school. Reading scores for students entering high school are particularly sobering. In high poverty schools, fewer than one-in-six students read at grade level (Perie et al., 2005). Half of freshman students have reading scores more than two grade levels below ninth grade expectations (Balfanz et al, 2002). Not until the junior and senior years of high school do we see an upward trend, and these results are significantly skewed due to high school drop-outs. Although we still have little meaningful data on who drops out and when, it does not take a Carnegie Foundation fellow to surmise that students who have dropped out of the system by this point tend to be those most challenged by lack of literacy skills. And, even those students who remain in the comprehensive high schools on the college-track face challenges. Only have of the college-bound students taking the ACT college entrance exam were found ready to complete college-level reading assignments in core subjects such as English, history, math, and science (ACT 2005). Why are we failing our secondary students? The predominant educational philosophy in American schools can be summarized as this: Learn the skills of literacy in K-6 and apply these skills to learn academic content in 7-12. In other words, learning to read should transition to reading to learn. Courses have been organized in middle schools (or junior high schools) and high schools by academic areas. Even English is considered an academic content area, primarily organized by literature content standards in most school districts. 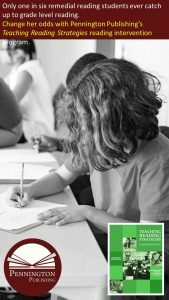 Most secondary English teachers consider themselves as teachers of literature, less so that of reading or writing. Teachers have been trained and hired to reflect this secondary focus. 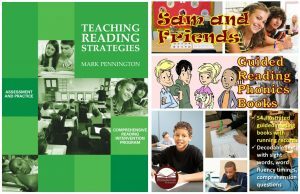 For example, secondary teachers in most credential programs still only take one post-graduate “reading strategies” course. Clearly, this educational philosophy and its application are failing a sizeable portion of our secondary students. To meet the increasing demands of Twenty-First Century literacy skills, we need to abandon the current educational reading philosophy at the secondary level. 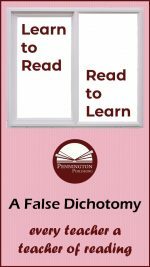 Every secondary teacher needs the training to re-orient instruction and coursework to both a learning to read and a reading to learn pedagogy. Yes, every teacher a teacher of reading (and writing). Now, obviously some disciplines should shoulder less of this responsibility. No one is suggesting that geometry teachers should abandon teaching theorems and begin teaching reading fluency. Both university and school districts need to develop partnerships to improve this expertise and re-write curriculum to reflect this focus. New collaborative partnerships need to be formed, in terms of flexible cohorts with professors and adjunct district personnel teaching both pre-service and in-service professional development in literacy skills. We also have to get past our mortar and brick biases and embrace online education to accomplish these ends. This focus ongoing professional development should be key to Response to Intervention (RtI) at any secondary school. Secondary school curriculum and instruction must be both content and process focused. And this re-orientation is not solely for students with poor literacy skills; this paradigm shift is for our “best and brightest,” as well. We already have the diagnostic tools to differentiate instruction, now we have to make the commitment to doing so. Higher level reading involves analysis, critical thinking, and problem-solving. All students need explicit instruction to master the rigorous demands of Twenty-First Century academic reading. Once this instruction is mastered, we can then more effectively return to reading to learn. Learning how to do sound-by-sound spelling blending takes a bit of practice. Blending the perfect margarita? Maybe even a bit more practice! For both beginning and older, struggling readers, blending is an essential instructional activity. I refer to my blending technique as sound-by-sound spelling blending to emphasize the connection between the speech sounds (phonemes) and the alphabetic symbols (spelling). First, read the brief directions. Second, read through the Sound-by-Sound Spelling Blending Script a few times to understand the procedure and pick up on the rhythm of this instructional activity. Third, read the Instructional Sequence Criteria. Fourth, check out the instructional video. 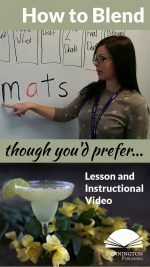 Finally, download the FREE Sound-by-Sound Spelling Blending Instructional Sequence to practice and see the quality of my instructional programs. Position your students such that your body does not obstruct their views of the board. Use black or blue markers for the consonant sounds and red or orange for the vowels. Write blanks to indicate spellings that require other sounds before or after in the same syllable. What about syllable blending. Check out this article and FREE download: Syllable Transformers.